At a recent private dinner party, my host served two vintages of Black Hills Nota Bene, 2007 and 2005, and mentioned that he had recently taken delivery of a case of the 2008. As it happened, I had just tasted the 2008 Nota Bene, along with the three other wines that Black Hills released recently. We got into the conversation about how long Nota Bene ages, triggered by my view that the 2008 is drinking so well now that one should not tuck it into the cellar and forget about it. Then I noticed that Black Hills has just sold some boxes containing a 10-year vertical of Nota Bene, beginning with 1999. The winery believes that this iconic Okanagan red will cellar at least that long, depending on how well it is stored. I have tasted other Nota Bene verticals. While I think the wine peaks at about seven years, how long it stays on that plateau is still to be determined. My host has a fine air-conditioned cellar. His case of the 2008 might easily make it to 2018, except that it tastes so good now that it may not be around that long. Black Hills was launched by two couples who were changing from Vancouver business careers. In its first few years the winery made only one wine, the red blend called Nota Bene, which is Latin for “take notice”. Consumers did indeed take notice. 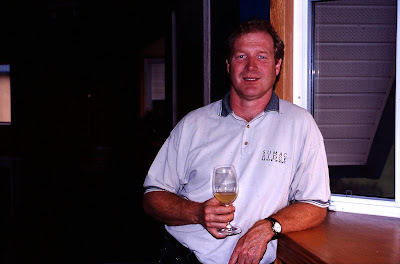 Within months after releasing the first wine, Black Hills had such a cult following that the tasting room rarely was open. Most of the wine was snapped by those able to get onto the mailing list. In 2007, the winery was purchased by a group of 265 investors, among them a Hollywood actor named Jason Priestley. The cult following has continued, even as the wine prices have risen somewhat. A few years ago, a Nota Bene release was sold out in 37 minutes. The 2008 Nota Bene, which I will review a little later in this blog, is technically sold out as well. However, a diligent search will unearth a few in private wine stores. As well, the new owners of the winery do open the tasting room from time to time. It is possible to buy the wines from time to time, and also to get onto the winery’s email list (the wine club) so that you get a shot at buying a case when it is released. The wines are not inexpensive but if you cannot find a friend or two to share a case of wine this good, you need to make new friends. Nota Bene’s claim to age worthiness relies on the fact that the wine is usually built on a foundation of Cabernet Sauvignon. Nota Bene 2008 ($60) is 48% Cabernet Sauvignon, 41% Merlot and 11% Cabernet Franc. It begins with an appealing aroma of red fruit with vanilla and mocha. It is rich and ripe on the palate – one of the ripest tasting Nota Bene wines that I can recall – with flavours of plums, black cherries and vanilla. On the finish, there are hints of chocolate, more red berries and spice. The soft, ripe tannins make the wine accessible and delicious. We decanted it at home which, no doubt, allowed it to open even more. 91-92. The immediate lushness of this wine leads me to caution collectors not to put it away and forget it, just in case this wine peaks early. Perhaps it won’t. My host’s 2005 Nota Bene is very good now and still seems to be developing in the bottle. The other three recent releases from Black Hills are also wines that you will want to talk about as you enjoy them. Black Hills Carmenère 2008 ($50), a very small production red, is one of the very few wines grown in Canada from the Carmenère grape, an old Bordeaux variety now grown mostly in Chile. Not much of the variety grows in the Okanagan, largely because it is a late ripening grape – perhaps too late for much of the Okanagan. The Black Hills wine is not one you will forget once you taste it. There is a remarkable amount of pepper in the aroma and on the palate, along with cherry and currant flavours. It is entirely possible that the pepper might have disappeared if the grapes had been marginally riper (the alcohol is 13% compared with the Nota Bene’s 14.2%). I like peppery wines but I have tasted with people who don’t care for this character. Still, more people rather than fewer will enjoy this wine, particularly with a big steak. 88. The following two wines are available from the winery, by the case. Black Hills Chardonnay 2008 ($30). There is no debate here: this is simply a delicious and elegant Chardonnay, tasting of tropical fruits and citrus and with a touch of butterscotch. The finish lingers. 90. Black Hills Alibi 2009 ($30). This wine is primarily Sauvignon Blanc with roughly 20% Sémillon. Here is another fine white, appealing as soon as you get your nose in the glass and smell the twist of grapefruit rind and the spice. On the palate, the zesty flavours show herbal notes with hints of grapefruit. Rich on the palate, the wine is elegantly balanced to finish crisply. 90. Another veteran Okanagan winemaker has become a free agent. Mark Wendenburg left Sumac Ridge in May after 18 years with one of the Okanagan’s premier estate wineries. Succeeding him in the cellar is Jason James, who came to Sumac Ridge in 2005 from a winery on Ontario. Mark is likely to take on some consulting assignments. He has already had exploratory calls from other wineries but, so far, there has not been a fit. Meanwhile, he is bringing his résumé up to date and looking after the family vineyard in Penticton – five acres of mostly Pinot Blanc that he planted about 1980 with his father, Chris. That was Mark’s introduction to the wine industry. After helping plant the family vineyard, Mark went to Germany in 1982, spending five years studying at a Bavarian wine school and apprenticing with wineries in three regions. On returning in 1987, he started working at the T.G. Bright & Co. winery near Oliver. That was when the commercial wineries were importing fresh grapes to make jug wines, not finished wine. Brights was also making smaller lots of wine from Okanagan grapes but the winemaker in charge of that was the late Frank Supernak. In winter of 1988, Mark did a crush at the Nobilo winery in New Zealand; the following winter, he did the crush at S. Smith & Sons in Australia (better known as Yalumba). In between those assignments, he resumed working at Brights but also became involved in a sparkling wine project that had been launched on the Okanagan by California’s Schramsberg Cellars with Inkameep Vineyards and what is now Blue Mountain Vineyard and Cellars. One of his bosses at Brights told him to choose between Brights and the sparkling wine project. Mark chose the sparkling wine project. Steller’s Jay is now one of Canada’s best traditional method sparkling wines, an elegant blend of Chardonnay, Pinot Noir and Pinot Blanc. In the 2005 vintage, the current release, the winery made 7,500 cases. The awards won by this wine are useful ornaments on Mark’s résumé. Among others, Steller’s Jay Brut 2001, as an example, was sparkling wine of the Canada in the 2004 Canadian Wine Awards and also got a Lieutenant-Governor’s Award of Excellence in Winemaking. Mark’s departure might be seen as the inevitable changing of the guard that has been taking place gradually since Constellation Brands took over several years ago. Harry McWatters, who founded Sumac Ridge in 1980 and sold it to Vincor in 2000, retired last year to run his own consulting firm. Harry’s daughter, Christa-Lee, left this year to work with her father in various businesses. Bruce Fuller, the owner of Rustic Farm & Cellars winery south of Oliver, was having lunch at the winery’s picnic area when the mudslide thundered down Testalinden Creek on the afternoon of Sunday, June 13. It swept by Rustico Farm but it destroyed or damaged homes, vineyards and orchards on about 20 nearby properties. This Sunday, June 27, Rustico’s picnic area will be open for what is being called “an old-fashioned country-style potluck.” The purpose: a fund raiser to help victims of the mudslide. So far, those individuals have been promised some provincial aid but there is no insurance available other than through litigation. If ever a winery’s front yard fits the image of a country potluck, this is it. The winery house is a log cabin with a sod roof. There is a farmer’s grain wagon at the winery’s driveway (Bruce found it on Craig’s List and traded a few cases of wine for it). The buggy just outside the tasting was made in 1902 in Ontario for use by doctors. The tasting room is decorated in the style of a country antique store. The wines are named in keeping with this theme: Doc’s Buggy, Farmer’s Daughter, Isabelle’s Poke, Mother Lode and Last Chance. A couple are associated with One-Armed Reid, supposedly the prospector who staked the first claim at the Fairview site near Oliver. Sunday’s fund raiser has sombre reasons but, like an Irish wake, this promises to be an entertaining afternoon for those who come out for it. Bruce is a former marketer (he once worked in Jimmy Pattison’s organization) who set out early this decade to establish a winery. After a couple of false starts and a falling out with a partner, he was able to acquire control of this property in 2007. There is a lot of history in this Golden Mile property. It was Crown land when purchased in 1963 by a dapper Hungarian immigrant named John Tokios. He worked many years at silver mine at Beaverdell in eastern British Columbia. As that mine was winding down, he took apart a log bunkhouse and re-assembled it here. For exterior ornamentation, he hung up sub-bleached skulls and antlers scavenged from the nearby hills. Bruce, who now lives in the house, removed much of the ornamentation. Aside from that, the place looks a lot like it did in the Tokios era. John Tokios began planting vines here in 1968. Some of the varietal choices have changed over the years – Okanagan Riesling, for example, is gone. The vineyard now grows Merlot, Zinfandel, Pinot Noir and Gewürztraminer but still has one of the Okanagan’s last plantings of Chancellor, a serviceable red French hybrid. His ideas of romance include a working ice box to make ice for chilling the wines and for producing chunks of ice for children, a treat on a hot day. Wines are served in tumblers although Bruce has stemware hidden away for those who insist on it. This spring one guest grumbled at using tumblers until he was squelched by another who said he had just spent two weeks in Italy and all the wineries he visited there used tumblers. The irony is that Bruce’s original concept was to replicate an Italian village in the Okanagan. The rustic character of the Tokios farm took over and led him in a different direction. This is a winery with lots of personality, including an owner who can be larger than life. Mother Lode Merlot 2007: Every wine has a story which Bruce recounts with great theatricality. The reference here is to a mother lode of gold that a prospector named One-Armed Reid was looking for. He would have been happy with this tasty red, a medium-bodied wine with a core of sweet fruit. 88. Last Chance N.V.:One-Armed Reid, according to Bruce’s narrative, staked the first claim at Fairview. This wine is a blend of Chancellor, Merlot and Zinfandel. The percentages are not disclosed but I would guess from the cherry flavours and the slightly bland personality that there is a lot of Chancellor here. One-Armed Reid would like more Zinfandel next time but this will slake a miner’s thirst in the meanwhile. 85. Isabella’s Poke 2008 Pinot Gris: The story here refers to Isabella’s popularity with the miners. Never mind the double entendre. This is a crisp, refreshing white, full of fruit flavours – pears, apples, gooseberries. 88. Farmer’s Daughter 2008 Dry Gewürztraminer: The myth here has to do with a daughter of Alsace parentage. The wine is indeed made in the Alsace style, almost austerely dry but with rich spicy flavours and aromas. 87. The 2009 growing season in the vineyards of Vancouver Island was one of the best in the decade. The proof is now emerging as the island wineries begin to release wines from that vintage. Recently, I visited and taste at nearly all the island wineries. I will pass on my notes on the wines that most pleased me. At a few wineries, the visits were early enough in the morning that the owners chose to send me away with samples rather than taste. I will add those notes to this blog later. You may want to revisit this post a few times. You might also taste these (and other) wines at Taste: Victoria’s Food and Wine Festival July 15 through July 18. The major tasting is at Crystal Gardens. Check www.victoriataste.com. I have already blogged on the Rocky Creek Winery’s releases, the first of the impressive 2009 wines that came my way. Several wineries, among them Blue Grouse and 22 Oaks, have yet to release their 2009 wines. Zanatta Vineyards has no vintage dates on its sparkling wines (notably the Taglio Rosso, a superb red bubbly of Cabernet Sauvignon and Castel). None of the island wineries is large. Most of the wines are released in limited volumes of a few hundred cases at best. Don’t wait too long into the summer without scheduling your own island wine tour – or ordering some of the wine over the internet. Because the 2009 season was long, warm and dry, the grapes matured very well, often so well that winemakers did not need to adjust either the sugar levels or the acidity. That was in dramatic contrast to the vintages of 2007 and 2008. Both were wet and/or cool years, so much so that some vineyards abandoned late ripening grapes entirely. Good wines were made in both years by producers where there is first-rate grape growing and the winemaking. So far, the 2010 vintage is shaping up as another challenge for the coastal wineries, although a warm, dry summer and a long autumn might save the year. No doubt, good wines will be made by those whose viticulture and winemaking is up to the challenge. Meanwhile, there are those terrific 2009s to enjoy. Here are some notes. Averill Creek Vineyard 2009 Gewürztraminer ($18.00). The wine begins with lovely aromas of spice and rose petals. On the palate, there are flavours of spice, lychee and citrus, with a refreshing, dry finish. 90. Averill Creek Vineyard 2009 Pinot Grigio ($18.00). The wine is fresh, light and tangy, as the Pinot Grigio style should be, with green apple flavours and a crisp finish. 88. Averill Creek Vineyard 2009 foch-éh ($18.00). This is a fun summer patio red from Maréchal Foch grapes vinified by carbonic maceration. Think Beaujolais Nouveau – soft and fruity. 87. Beaufort Vineyard & Estate Winery 2009 Ortega ($18). A gold medal wine, this refreshing wine has zesty spicy aromas and flavours of grapefruit, not unlike Sauvignon Blanc. 88-89. Beaufort Vineyard & Estate Winery 2009 Pinot Gris ($18). Two-thirds of the grapes in this wine are Okanagan, the rest from Vancouver Island. Tasting of pears and citrus, this is a crisp, refreshing white. 88. Beaufort Vineyard & Estate Winery 2009 Siegerrebe ($18). This wine is made from the first estate-grown grapes from Beaufort’s young Comox Valley vineyard. The wine is packed with juicy flavours of tropical fruits and has a lingering finish. This won the winery a bronze at a competition in London. 90. Beaufort Vineyard & Estate Winery 2009 Panacea ($18). Another gold medal winner, this is a lovely blend of Madeleine Sylvaner, Pinot Gris, Schönburger, with a dash of Siegerrebe. The wine is dry but so fruity that it tricks the palate into believing it is off-dry. There are flavours of pink grapefruit, honey dew melons and guava. 88-90. Beaufort Vineyard & Estate Winery 2009 Wild Child ($17.50). This wine is so named because fermentation started on its own with the wild yeasts on the grapes. It is made with Madeleine Sylvaner but comes across as a peachy Chardonnay with dry, nutty finish. Most intriguing. 88. Beaufort Vineyard & Estate Winery 2009 Ça Beautage ($. N.A.). Like the Siegerrebe, this wine is from the winery's Comox Valley grapes - Marechal Foch, Leon Millot and Cabernet Foch. This is a big, bold red, with spicy flavours of black cherry, chocolate and liquorice. 90. Blue Moon Estate Winery 2009 Dusk ($17.90). Blue Moon is a fruit winery near Courtenay that grows or tries to buy organic fruit. Dusk is an off-dry blueberry wine delicious on its own but dry enough to pair with food. 88. Blue Moon Estate Winery 2009 Soleil ($16.90). This is a blend based on nine varieties of organic apples. Vibrant and refreshing, it is balanced just off dry. 88. Carbrea Vineyard & Estate Winery 2009 Gewürztraminer ($22). Made from estate grapes on Hornby Island, this wine begins with a rose petal aroma. On the palate, there are notes of grapefruit and spice. 87. Chase & Warren Estate Winery Alsatia 2009 ($N.A.). You have to go to the winery in Port Alberni to get this wine, a white blend based on Pinot Gris and Auxerrois. The wine is juicy and harmonious. 87. Cherry Point Estate Winery 2009 Ortega-Siegerrebe ($N.A.). There are new owners, a new winemaker and new ideas at Cherry Point, one of which is adding 20% Siegerrebe to increase the fruity aromas and flavours in this blend. 88. Cherry Point Estate Winery 2009 Gewürztraminer ($N.A.). This off-dry white shows peach and lychee flavours, with moderate spiciness. 88. Divino Estate Winery Trebbiano 2009 ($N.A.). Joe Busnardo planted this white Italian variety in the Okanagan and planted it again when he relocated his winery to the Cowichan Valley in 1996. The wine is crisp, refreshingly light, with citrus notes. 87. Most of the Divino wines are either non-vintage or older vintages (including a 1989 Chardonnay from the winery’s Okanagan period). The tasting room is open Friday and Saturday afternoons and there is no spittoon because Joe believes in swallowing wine. Enrico Vineyards 2009 Pinot Gris ($N.A.). This south Cowichan Valley winery expecting to open its Telegraph Road tasting room next year. I was given a taste of an unfinished but promising tank sample of Pinot Gris. I scored it 87 but I would like re-taste it after winemaker Sarah Cosman does the final polishing filtration and bottles it. Garry Oaks Winery 2009 Pinot Gris ($23.90). Recently released by this Salt Spring Island winery, this wine has already won a gold medal in a credible competition. This wine begins with aromas of citrus, apricots and spice. On the palate, there are rich flavours of peach, apricot, ripe apples, with a spicy finish. 90. Garry Oaks Winery Prism 2009 ($21.90). This bold Gewürztraminer announces itself with a dramatic spicy aroma. On the palate, it has the richness of fruit and texture that recalls a fine dry Gewürztraminer from Alsace. The winery’s notes speak of flavours of peach, ginger and lime and I certainly concur. 91. Glenterra Vineyards 2009 Vivace ($20). When John Kelly took over this Cobble Hill property, he kept a block of experimental vines and now produces remarkable blends. Vivace – dry, crisp, with complex flavours of herbs and melons – is a field blend of 30% Pinot Gris, 10% Ortega, 10% Müller-Thurgau, 5% each of Bacchus, Siegerrebe, Auxerrois, and Chasselas; with the remaining 20% consisting of Ehrenfelser, Schönburger, Muscat, Wurzer, Regent, Huxelrebe, Gloria, Reichensteiner and Cantaro. There is probably no other wine in the world quite like this. 88. Glenterra Vineyards 2009 Gewürztraminer ($22 but sold out). Only 35 cases were made of this delicately perfumed wine, with citrus and lychee flavours and with a crisp finish. 88. Mistaken Identity 2009 Abbondante Bianco ($17.90). From its organic Salt Spring Island vineyard, Mistaken Identity got grapes ripe enough to produce a wine with 13.2% alcohol. This blend is built around Madeleine Angevine but also includes Madeleine Sylvaner, Siegerrebe, Ortega, Reichensteiner and Pinot Gris. Well-balanced and crisply finished, this refreshing wine has herbal and melon notes on the nose and on the palate. 89. Mistaken Identity 2009 Pinot Rosé ($17.90). This is a 135-case blend of 40% organic Pinot Noir from the Okanagan and 60% organic Pinot Noir from the island. The result is a refreshing, medium-bodied, dry rosé with appealing aromas and flavours of raspberry and strawberry. 88. Salt Spring Vineyards 2009 Aromata ($19.90). Light and refreshing, this wine begins with floral aromas and presents flavours of herbs and citrus, with a touch of spice on the finish. It is a blend of Auxerrois, Sylvaner and Bacchus. 88. Salt Spring Vineyards 2009 Blanc de Noir ($18.90). This Pinot Noir rosé is made entirely with estate-grown grapes. The lovely strawberry bronze hue gives it immediate eye appeal. The flavours recall rhubarb and strawberry. The wine is light and refreshing. 88. Later this season, the winery will be releasing a white yet to be named that is made from two of the Swiss hybrid grapes grown on the island, Petit Milo and Epicure. This promising new blend shows honeyed fruit flavours on the palate but finishes crisp and dry. Starling Lane Winery 2009 Pinot Blanc ($18.90). The wine shows flavours of melons and apples and as a tangy, crisp finish that says, bring on the oysters. 89. Starling Lane Winery 2009 Gewürztraminer ($18.90). The wine begins with spicy and floral aromas. On the palate, there are ripe flavours of spice and grapefruit. The finish is dry and lingering. 89. Starling Lane Winery 2009 Ortega ($18.90). If you tasted this zesty wine blind, you might take for a Sauvignon Blanc with its notes of lime and grapefruit and its refreshing finish. This wine raises the bar with Ortega. Surprisingly, winemaker John Wrinch complains it is not complex enough and he is debating what to blend into the wine. I’d caution: it’s not broke, be cautious fixing this delightful white. 90. 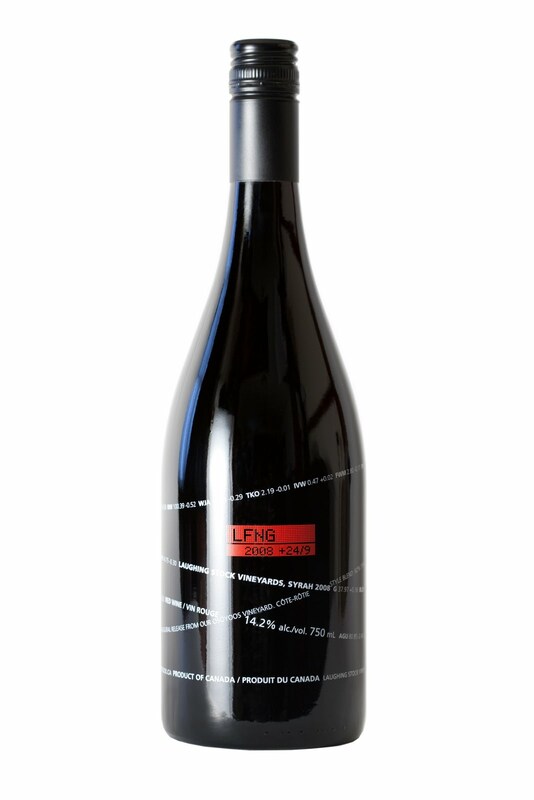 Starling Lane Winery 2009 Star Ortega ($18.90). This is an off-dry version of the Ortega. The 10 grams of residual sugar lift the mouth-filling peach flavours. It has been a big hit in the wine shop. 90. Venturi-Schulze Vineyards Terracotta 2009 ($32.00). The winery has taken a blend of Ortega and Siegerrebe to a higher level, producing a rich, golden-hued wine with flavours of apricots and tangerine and a nutty note on the finish. Marilyn Schulze says the wine reminds her of “pie crust.” 90. Venturi-Schulze Vineyards Pilastro 2009 ($19.50). A blend of Schönburger and Kerner, this fruity wine tastes of peaches, tangerine and melon. It is an off-dry wine exquisitely balanced to appeal to a wide range of palates. This is one of this winery’s first off-dry table wines and it is flying out of the tasting room. 88-90. This is one of several innovations at this winery. Venturi-Schulze has switched to screw caps on conventional bottles after more than a decade with crown caps on Champagne bottles. The labels also have switched to an exciting contemporary design. Ever provocative, Naramata Road’s Laughing Stock Vineyards recently announced that it will roll back its wine prices slightly when the harmonized sales tax (HST) kicks in next month. This is a poke in the eye at the B.C. Liquor Distribution Branch which is not passing on the modest savings that HST creates in wine prices. The LDB, of course, is marching to orders that come down from the government in Victoria. That government is trying to convince us how much business will benefit when the sales taxes are harmonized and how those savings will be passed on. That may well be true. So why do the hypocrites in Victoria not require a business they control to pass along savings as well? Is it any wonder almost no one believes the government’s pronouncements on the HST? Currently, wine is subject to the 5% Goods and Services Tax and the 10% provincial sales tax. When the two are harmonized, the rate will be 12%. While a 3% reduction is not that big a deal, it is the attitude that counts. A lot of people will appreciate Laughing Stock’s gesture. They can appreciate it with an expanded offering. The six wines just being released include two new ones – the winery’s first Viognier and its first Syrah. The wines, in a word, are impressive. There might be a minor quibble that the alcohol levels in the whites are a touch muscular. However, this goes with the turf: like many other Okanagan wineries, Laughing Stock picks grapes on flavour. That involves letting the grapes get good and ripe. Viognier in particular is a variety that expresses its flavours during a small window of full ripeness. 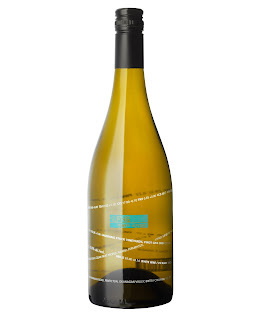 The trade off is robust alcohol levels (14.6% in the case of Laughing Stock’s Viognier) that generally are balanced by rich, ripe fruit flavours. All the Laughing Stock wines deliver so much flavour that alcohol becomes a minor issue. Pinot Gris 2009 ($20.10). This delicious wine begins with aromas of pear and citrus (the winery says kiwi and pineapple, so you’ll have to decide). On the palate, there are layers of flavours of ripe pears, melons and apples, with rich weight on the palate, yet with a crisp finish. 540 cases were made. 90. Blind Trust 2009 White ($25.10). 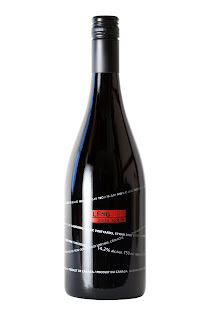 In both this wine and the companion red, the winery prints the varietal composition on the neck of the bottle and then covers it with the capsule. The inspiration is a blind trust in business – where a pool of assets will be managed by a third party to eliminate conflicts of interest. The owner of the assets takes it on blind trust that his manager is doing a good job. With these wines, you take it on blind trust that David has assembled good blends. 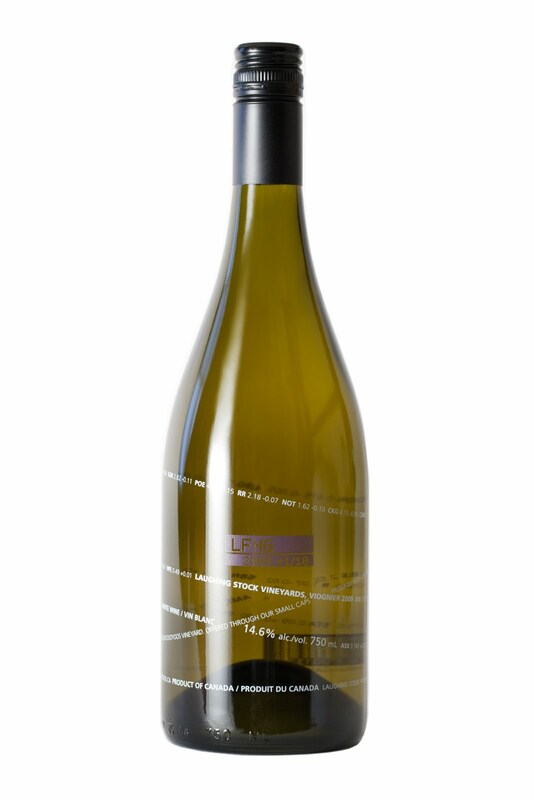 This 2009 white is a blend of 59% Pinot Gris, 15% Sauvignon Blanc, 13% Viognier and 13% Pinot Blanc. The wine begins with intriguing herbal and floral aromas. The flavours are complex – pears, apples, citrus, banana – and the finish is dry, with a bit of the Viognier firmness giving the wine a good spine. Production: 420 cases. 90. Viognier 2009 ($26.10). This is a powerful wine. The tropical aromas just surge from the glass and the flavours deliver notes of pineapple, peach and mango. A wine-savvy guest who shared this wine with me remarked that “things are just popping in your mouth.” You bet they are. Only 150 cases were made. 91. Pinot Noir 2008 ($29.10). Laughing Stock has been buying Pinot Noir grapes from an excellent grower in the Similkameen Valley, whose grapes have made excellent wines in the hands of several different winemakers. Few have handled that fruit as well as David. This is a generous wine, with aromas and flavours of cherry and strawberry and with a seductively silken texture. Only 180 cases were produced. 90-91. Syrah 2008 ($34.10). There is eight per cent Viognier in this wine, a technique one often finds with Syrah. Paradoxically, Viognier helps bind the colour of Syrah (this is a dark red wine) as well as lifting the aromas. This is a big, juicy wine with spice and black cherry aromas and juicy flavours of plum and blackberries. The ripe tannins give this wine a generous texture. The screw cap closures preserve the fruity freshness. I’d like to come back to this wine when it has aged in bottle another several years. Production: 302 cases. 88-90.